We are proud to announce that Vtiger has been awarded the ISO 27001 certification, an internationally recognized information security standard ensuring services meet the data security needs of customers through an effective quality management system. While we always adhered to strong security standards, our practices have now been certified as meeting internationally recognized standards. The certification reassures that our customers can trust that their most valuable data, whether personal, customer, or financial, is safe on Vtiger CRM. And it demonstrates Vtiger’s commitment to provide a high-quality service to its customers and our ongoing investment in technology, development, processes and procedures. The ISO/IEC 27000 family of standards helps organizations keep information assets secure. ISO/IEC 27001 is a security management standard that specifies security management best practices and comprehensive security controls. The certification requires development and implementation of a diligent security program, which includes the development and implementation of an Information Security Management System (ISMS) that defines how an organization such as Vtiger constantly manages security in a holistic, comprehensive manner. 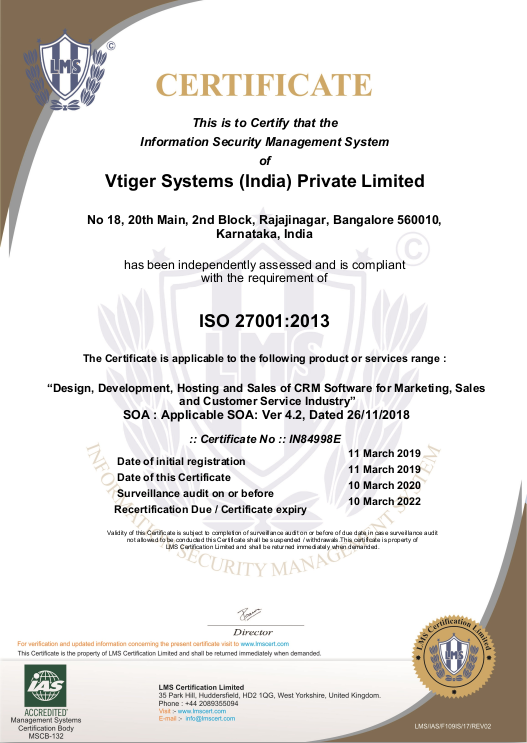 ISO 27001 certification guarantees that Vtiger securely manages its assets such as financial information, intellectual property, employee details or information entrusted to our company by third parties. Vtiger systematically evaluates its information security risks, taking into account the impact of threats and vulnerabilities. Vtiger designs and implements a comprehensive suite of information security controls and other forms of risk management to address customer and architecture security risks. Vtiger has an overarching management process to ensure that the information security controls meet its needs on an ongoing basis. ISO 27001 compliance means much more than meeting our customer’s requirements. It creates a culture within our organization and enhances employee professionalism, abiding by expectations and goals for business success. Sign-up for a free trial to explore powerful features in Vtiger CRM.